Drury Hotels is pleased to offer all attendees and employees of Norris Conference Center special discounted rates at the Drury Inn & Suites San Antonio Airport and Pear Tree Inn San Antonio Airport. 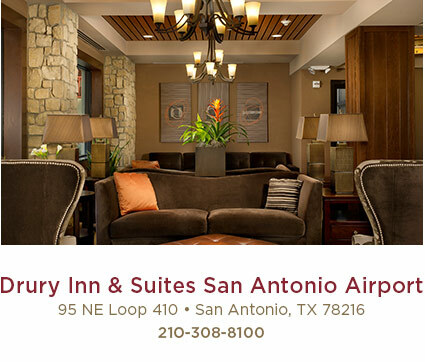 The 274-room Drury Inn & Suites San Antonio Airport is conveniently located one mile from the San Antonio International Airport and two miles from the Norris Conference Center. If you need to fill some free time outside of your conference, you are just seven miles from downtown San Antonio. Our airport location also offers multiple shopping and dining options nearby. At Drury Hotels, our focus is on you! You’ll enjoy Drury’s hassle-free, award-winning service plus our additional free extras that make any reason for travel a breeze! 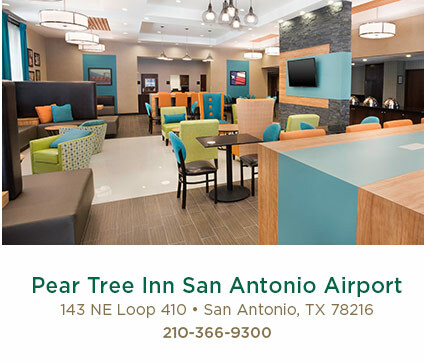 The 124-room Pear Tree Inn San Antonio Airport is conveniently located one mile from the San Antonio International Airport and two miles from the Norris Conference Center. If you need to fill some free time outside of your conference, you are just seven miles from downtown San Antonio. Our airport location also offers multiple shopping and dining options nearby. At Drury Hotels, our focus is on you! You’ll enjoy Drury’s hassle-free, award-winning service plus our additional free extras that make any reason for travel a breeze!